How useful is DNA extracted from the legs of archived insects for microsatellite-based population genetic analyses? DNA obtained from museum specimens provides a historical perspective on levels of genetic diversity. Archived samples are irreplaceable so it is desirable that only parts of the specimens are used, which constrains the amount of DNA obtained from small taxa. However, at present there are no quantitative data on yields of DNA from such samples. In this paper we determine the amount of DNA that may be extracted from the legs of museum-archived specimens of the damselfly Coenagrion mercuriale (Charpentier) and the suitability of this DNA for PCR-amplification of nuclear genetic loci (microsatellites). We find that (i) the yield of DNA correlates with the genotyping success rate and (ii) the amount of DNA obtained from the legs decreases with time since sample collection until 1954, before which no DNA could be detected (although DNA may be present in very low quantities). This cut-off point for successful DNA extraction corresponds with the date until reliable genotypes could be obtained by routine PCR. 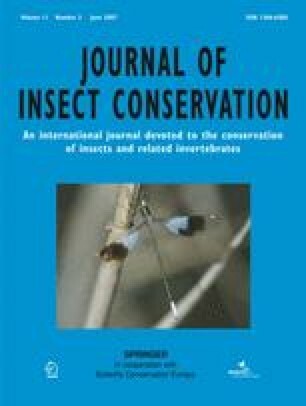 Thus, air-dried insect legs more than 50 years old appear to have limited usefulness for studies that seek to amplify many nuclear loci without the use of other techniques that may be used to increase the possible low-quantities of template DNA present. We are grateful to K. Goodger (Natural History Museum), G. Hancock (Hunterian Museum), G. Legg (Booth Museum), D.V. Logunov (Manchester Museum), G. McGavin (Oxford University Museum of Natural History), C. Palmer (Andover Museum), P.M. Pavett (National Museum and Gallery of Wales) and A.E. Whittington (National Museums of Scotland) who kindly supplied the C. mercuriale leg samples and the NERC (grant no. NER/A/S/2000/01322) for provision of funds. We also would like to thank two anonymous referees for their helpful comments on the manuscript.